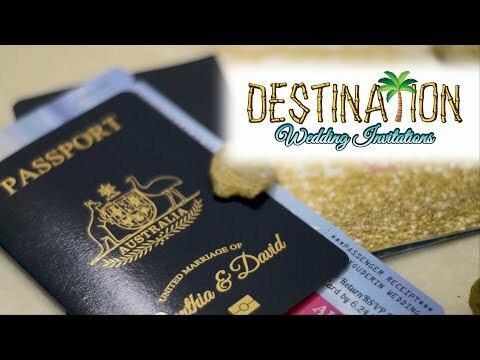 Welcome to Vanessa’s Destination Wedding Invitations, the passport wedding invitation experts! Planning a destination wedding? Or maybe a travel-themed birthday party or corporate event? With passports and boarding pass invites, your options are limitless! Whether you’ve come here to learn how to Do-It-Yourself, to order custom invitations, or to be inspired, you’ve found the right place! Not computer savvy? Not crafty enough? No worries! We provide professional-quality templates, custom graphic design and professional printing services. Our DIY section shows you step-by-step how to create your own stunning passport wedding invitations. Choose from several templates that include some of the most popular wedding resorts in the world! Print them yourself, or have us professionally print and assemble them for you! With us, you have the complete freedom to take-on as little or as much of your wedding invitation creation as you want! We know that destination weddings are beautiful and unique, and your invitations should be too! Let us be a part of this exciting adventure. We look forward to working with you!